No organisation works solely for awards, but the motivation rendered when peers and the best from the industry, award you for your excellence, is unmatched. It eggs us to do better and take a leap towards the next level & OUTPERFORM. Developing ‘first time right products’ has been a mission at MTB & with the latest award that we won, the attitude has established it even more strongly. 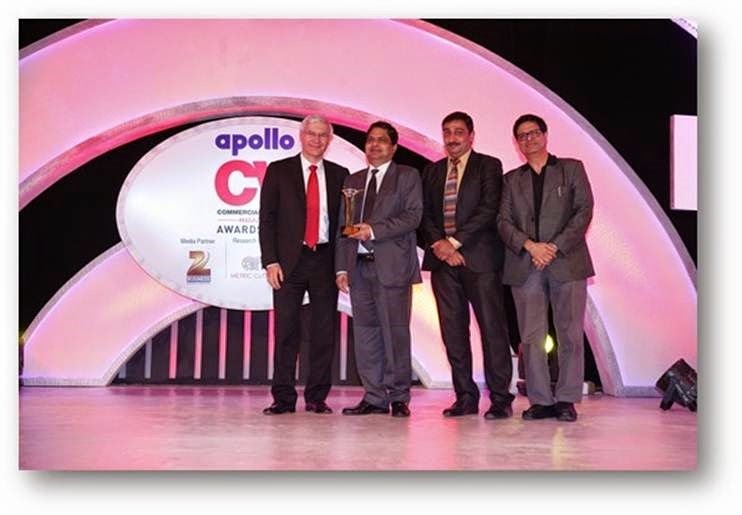 Apollo CV Awards 2015, a pioneering award event that attracts almost whole of the Transport Ecosystem was held on the 21st of January, 2015 at the ITC Grand Central. As the industry stalwarts watched us, our pride, The TRUXO 37 (170 HP) was declared as the HCV Rigid Cargo Carrier of the Year. This beast truly deserved the title, thanks to its robust engineering and high performance. With this, Mahindra Truck and Bus have won at the Apollo CV Awards for 5 times in a row. Now that’s what we call a winning streak. The award was received, on behalf of the entire MTBD Team, by Mr. Rajesh Mangal (Sr. VP – Sales and Marketing), Dr. Venkat Srinivas (VP and Head Engineering – Product Development) and Mr. Rajeev Malik (Sn. General Manager – Marketing) by the hands of Dr. Wilfred Aulber. The awards night was not restricted to metals being exchanged. 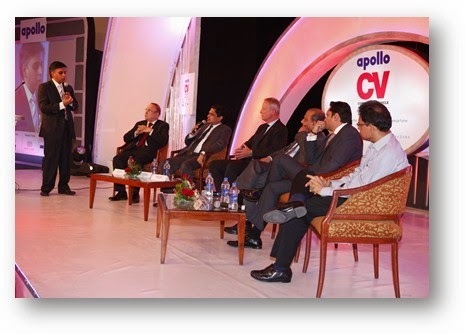 Valuable thoughts were shared as the awards night opened with a panel discussion on ‘CV Sector Growth in 2015’. Mr. Rajesh Mangal spoke on the future of the Commercial Vehicle Industry in India highlighting the triggers of success such as fuel prizes, revival in investments for infrastructure, new governance and policies etc. Joining Mr. Mangal, were other industry leaders like Mr. R. Ramakrishnan, SVP – Commercial, CVBU, TML, Mr. Anirudh Bhuwalka, CEO, AMW Motors, Mr. Vinod Agrawal, MD & CEO, VECV, Mr. Kristen Thulin, Director Marketing, Scania India and a senior representative from SML Isuzu. The Awards ceremony went beyond ceremonial speeches & glitz, offering a platform to all participants to interact and exchange ideas relevant to their sector.